Having won both the Nestle Children’s Book Award as well as Booktrust Early Years Book Award, this jolly book should not to be missed. 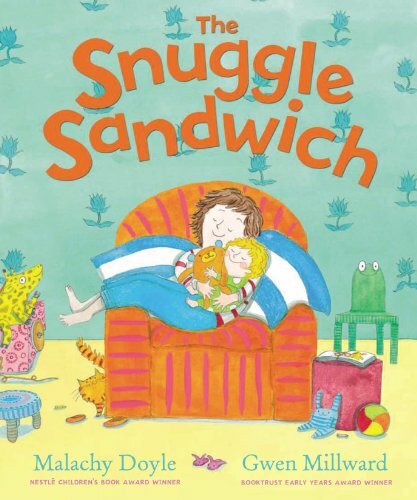 Doyle’s rhyming text positively bounces along, enhanced by illustrations that make the readers pause to study character and setting more closely. What is a snuggle sandwich? Why, mum and dad asleep in bed, with toddler Annie jammed between them! Breakfast, what a busy time, with happy Dad, big sister and teenage Joe, all bashing around the kitchen before departing for their own day. The gentle, rhythmic unfolding of events is well-paced, bringing the book to an end with peace and quiet. It is Annie’s favourite time, story time, when she and Mum make a DIFFERENT snuggle sandwich, this time teddy being the peanut butter! Bound to be a favourite in homes, schools and nurseries.